Sparkling Prosecco is more popular than ever, with plenty of bottles being quaffed all through the year. No longer just for celebrations, it’s taken its place as one of the most popular alcoholic drinks in the UK, Ideal Wine Company review the nation’s favourite bubbly. This ever-increasing market has also led to an increase in producers, styles, flavours and the number of vineyards needed to meet the demand. But what makes Prosecco so popular and why does it taste so good? 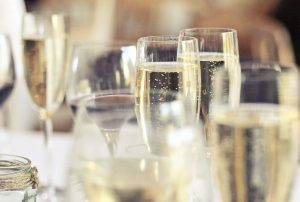 Prosecco is one of Britain’s favourite drinks – what makes it so popular? The key flavours in Prosecco come from its grape variety, the production method and, crucially, the location of the vineyards. The Italian favourite is grown in a huge area in north-east Italy, which covers hills, valleys and land just inland of Venice. With an area of 20,000 hectares up until last year, when another 3,000 ha were added to try and keep up with demand, the region is vast. However, it’s still smaller in size than Champagne, which covers 33,000 hectares and is therefore a third larger than Italy’s Prosecco producing area. While its area might be smaller, the region produces more bottles of Prosecco than Champagne manages. In 2016, it produced almost 475 million bottles, significantly more tan the average production of the Champagne region of 320 million bottles of fizz. This is mostly because the climate in Champagne results in lower yields per hectare. The region contends with frost when the crops are flowering and battles bunch rot during harvest, while Italy doesn’t have the same problems. There is also a very strict process of regulation in Champagne, which further restricts the number of bottles produced. The most productive areas are the hills of Montello and Asolo, the regions of Conegliano and Valdobbiadene and the slops of Cartizze. The grape variety used is also important for the distinct and more-ish flavour of Prosecco. The region took its name from the grape which was known as ‘Prosecco’ until 2009, when it was changed to ‘Glera’. This was part of a move by growers to protect the region and the product. They registered the word ‘Prosecco’ as a DOC (Denominazione di Origine Controllata). It was registered with the EU as Prosecco DOC. This effectively means that anyone who grows the Glera grape (which used to be known as Prosecco) outside of the DOC, cannot sell it as Prosecco within the EU. The Glera grape results in a wine with the floral-fruity flavours that we know and love from Prosecco. Most commonly you’ll find aromas of pear and apple, and when really ripe melon and peach. Other grape varieties are allowed to be used in making Prosecco. These include Pinot Grigio, Chardonnay and Pinot Bianco, but legally all Prosecco must have at least 85 % Glera. Most Prosecco is made using the Charmat method (also known as the ‘tank’ or ‘Italian’ method. It goes through a second fermentation in a stainless-steel vat and is then bottled under pressure. This is what gives Prosecco its fizz. Generally, this method gives a fruity, sweet and pleasing sparkling wine, which should be drunk while young. And it’s all of these reasons that make Prosecco the favourite, particularly in the UK, which accounts for a third of all sales. New data has shown the Ideal Wine Company that the impossible has happened; wine has overtaken beer to become Britain’s most popular drink! Living and working as a provider of fine wines from around the world who’s based in the UK, the Ideal Wine Company has learned that promoting wine in this country can be something of an uphill struggle. Tradition dictates that the UK is a nation of beer drinkers. Our parents, their parents, their parents and so on and so forth whiled away their nights down the local pub throughout their entire lives and it wasn’t wine they were drinking. Yet new data suggests that we’ve finally reached the top of the hill. Aided by the rise of Argentine wine, wine has overtaken beer to become Britain’s most popular alcoholic drink. Statistics from retail analysts Nielson showed that part of the reason for this change may be the rise in popularity of Argentinian wines. Demand for wines from the South American nation increased 35% in the space of a year. As such we can see why wine is now Britain’s most popular drink. More people are coming to realise that wine is a luxurious drink destined to take your taste buds on an adventure they’ll never forget!